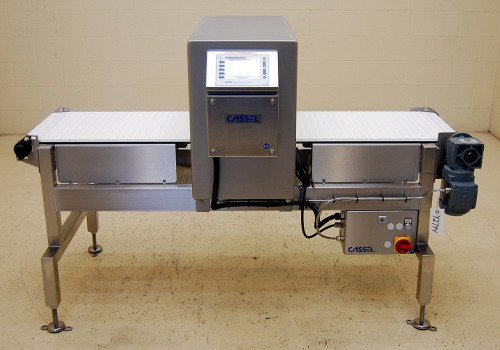 ...Cassel Metalshark2, 4-FREQUENCY washdown-sealed T316 stainless steel conveyorized metal detector, with a large 10 7/8 inch high (275mm) by 19 11/16 inch (500mm) wide USABLE aperture opening, mounted on a T316 stainless steel frame through-conveyor. OPERATOR CONTROLS with data connections: The search head is complete with integral touch-pad operator controls with a 5.4 inch color screen, including RS-232 and RS-485 serial data acquisition ports, and Ethernet data interface, in a T316 stainless steel enclosure. Optional data logging software is available for tracking and reporting for HACCP and other quality assurance and certification regimes. 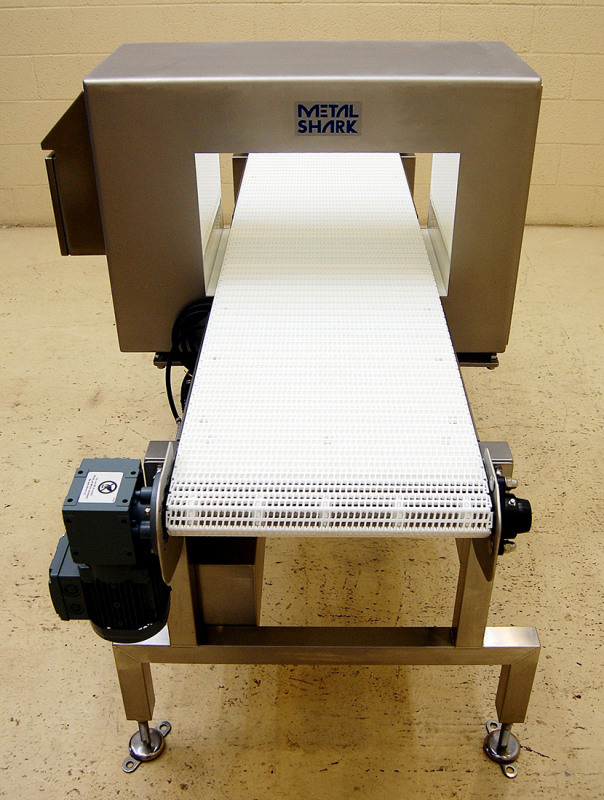 THROUGH CONVEYOR: The T316 stainless steel frame washdown belt transfer conveyor has a 71.5 inch long (1800 millimeters) long by 17 9/16 inch (450mm) wide interlocking plastic chain type belt, running at a 30 inch (762mm) working height, with adjustable feet allowing +/-4 inch (100mm) height adjustment. 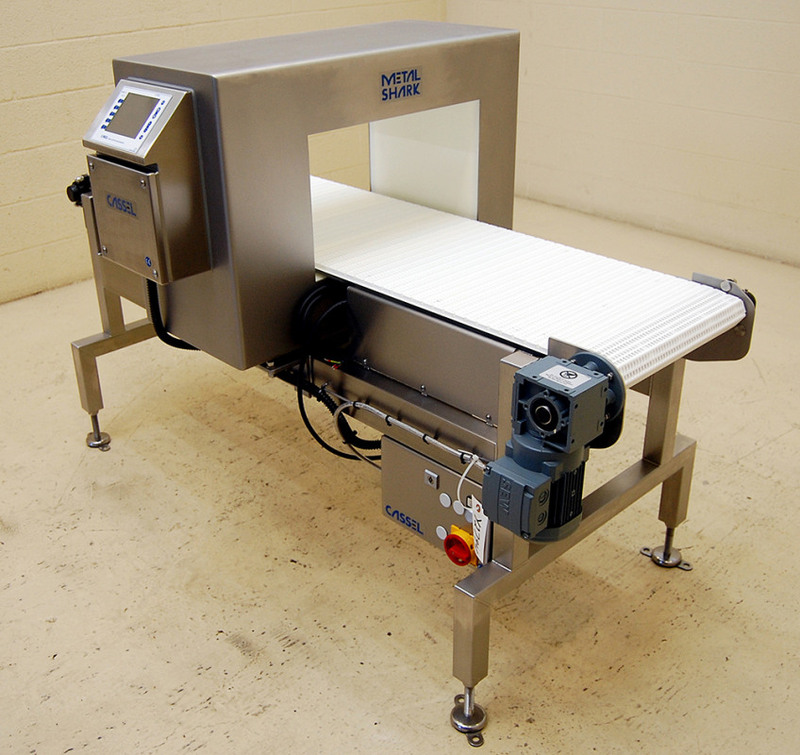 The thru-conveyor is complete with a belt-stop alarm reject configuration, and a variable frequency speed control for the 110 volt single phase drive, adjustable from 16 to 75 feet per minute (approximately 90 to 500 centimeters per minute) belt speed. 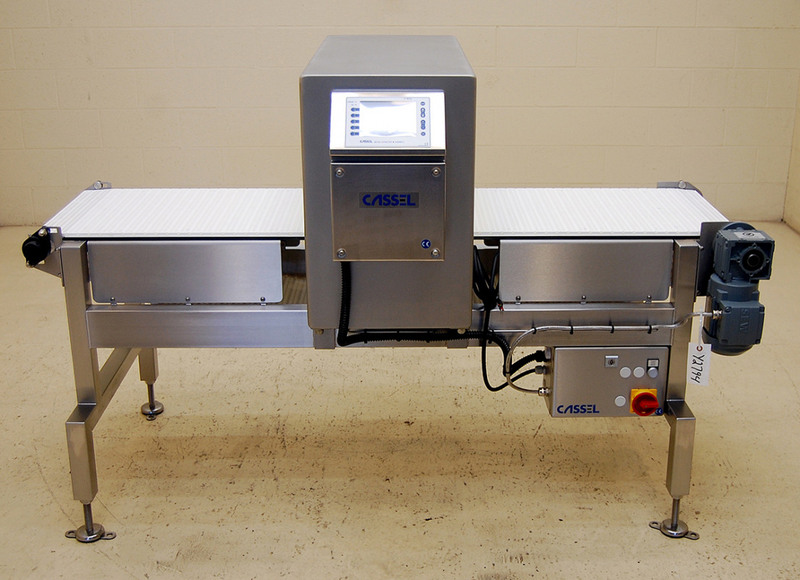 FOOD GRADE SANITARY: A metal detector for food processing metal detection. All food grade / USDA sanitary hose-wash-down 316T stainless steel construction (IP-67/NEMA 6 search head enclosure, IP-65/Nema4, 4x, 6, 12 & 13 control enclosure). 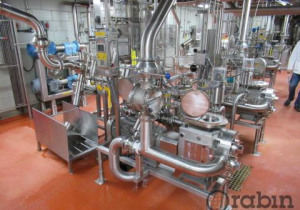 FOUR FREQUENCY LEVELS: 35kHz, 75kHz, 150kHz, and 300kHz, allowing for optimal sensitivity across an exceptionally wide range of products / product types (wet, dry, salty, meat, fruits, vegetables, fresh, frozen, hot, cold, etc) allowing for maximum versatility with the widest range of products. The optimal frequency is automatically set by the system in "product learn" mode to maximize sensitivity / minimize false rejects with your specific product. Sensitivity varies depending on product run, and frequency setting (determined by product characteristics), especially where wet, salty, or acidic products that are electrically conductive introduce "product effect" into the equation, however the manufacturer rates dry sensitivity for this head, with no product in the aperture, at a maximum sensitivity of 1.7mm ferrous, 2.3mm non ferrous, and 2.7mm stainless steel at 300 kHz. Quick teach feature learns new products in 4 to 7 passes. The control unit allows for 120 product presets, where product presets save the frequency setting with the other tuning data. Single control board technology with all control electronics on one circuit board maximizes reliability, and minimizes maintenance expenses. This is NEW EQUIPMENT and includes a 2 year manufacturer warranty on hardware / parts. We add hundreds of new listings every week. 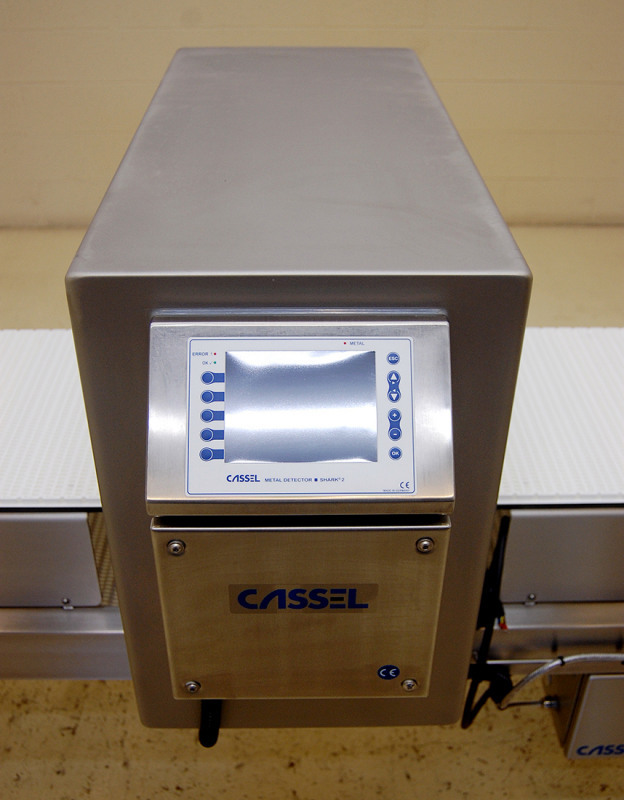 Be sure not to miss any Cassel T316 by subscribing to our email updates.